Fields has been a trusted and celebrated Irish jewellery brand since 1979. Having been awarded the UK and Ireland Jewellery Award on multiple occasions, it’s quality is beyond doubt as it puts customer satisfaction at the heart of all aspects of its operation. Quality materials are important too and you’ll find handcrafted pieces made from the finest white gold, rose gold, platinum, silver and beyond. This is a gem-fiend’s paradise, but those who are unsure what they’re looking for will find plenty of tools at their disposal — you can search its range by your preferred metal, chosen recipient, price, setting and a great many more options. You can even book a one-to-one diamond consultation at one of its stores to get help choosing your product and there’s a comprehensive set of buyers guides to give you all the information you need about sizes, cut, carat, clarity and more. Fields also does everything possible to ensure it has a positive environmental impact, signing up to numerous programs of responsibility including the Kimberley Process and Cafod. How do I use my Fields discount code? Sign up to Fields’ mailing list to hear about news & offers! Can I get Fields gift cards? Where is my nearest Fields store? Is there a Fields members club? Yes, the Privilege Club you can join gets you discounts on many of its items. See here! You can return your purchase within 14 days of receipt to receive a refund or within 30 days for an exchange. All items must be unworn, in original packaging and perfect condition. They must be posted to: Web Department, Fields Jewellers Ltd, 155 Townsend St, Dublin 2, D02 V274. Alternatively they can be returned instore though only for an exchange. Terms and conditions apply so see here for details. For times when words aren’t enough, you need a stunning piece of jewellery to express your affection. 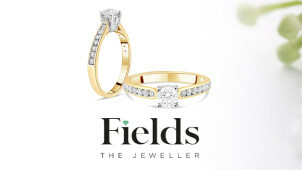 Whatever the occasion, Fields is sure to have something suitable being one of the most reputable jewellers in Ireland. Add a Fields discount code from vouchercloud and your next order could come in at a saving, getting you a beautiful necklace, ring, bracelet, watch and more for less. Its great service and high quality means you won’t be disappointed. If you’re after beautiful name brand pieces, Fields is the place to be. It features jewellery from the likes of Michael Kors, Bronzallure, Thomas Sabo and many more of your favourites. You’ll also find watches from TAG Heuer, Emporio Armani, Marc Jacobs and others. As an authorised stockist for all of the above you’ll find the latest lines straight from the manufacturer at great value prices. The best in the business are all at Fields! We’re big fans of the Celtic collection here at vouchercloud, as it provides a number of ways to celebrate rich Celtic history with its unique Irish-inspired designs. Its Claddagh, Trinity Knot and Shamrock Collections make for a stunning gift to yourself or a loved one, and with a Fields promo code in your pocket you’ll save money on these much beloved items too. Whether it’s a ring, pendant or bracelet, you can celebrate Ireland with one of these pieces today.